A South African team with a blend of youth and experience will do battle at the World Cup in England. The reigning African women’s champions, who are sponsored by Private Property, have announced their 18-player squad for the 2018 FIH Vitality Hockey Women’s World Cup. The team qualified for the tournament by virtue of a fifth-place finish at the FIH World League Semi-Final in Johannesburg in June 2017. The squad features a blend of some superb youngsters coupled with experienced campaigners. The team will be missing stalwarts, Ilse Davids, who retired recently, and 2016 SA Player of the year, Celia Evans, who misses out through a knee injury. The team does however retain a core of experienced players to guide the younger players through what will be a challenging tournament. This will be the fourth world cup for Shelley Jones and Dirkie Chamberlain while Lisa-Marie Deetlefs and Sulette Damons will take part in their third. Captain Nicolene Terblanche returns for her second after featuring at The Hague in 2014. There is a return to the squad for Tarryn Glasby and Lilian du Plessis who missed out on the Commonwealth Games, adding a much-needed threat in front of goal to the explosive talent of Candice Manuel. In defence, the experienced trio of Erin Hunter, Nicole Walraven, and Kara Botes will be joined by the exciting Simone Gouws, who was the Junior Player of the Tournament at the recently completed IPT. Kristen Paton and Ongi Mali, often spoken of as the future of SA Hockey, will now be a very active part of the present. The team is completed by the Western Province duo Quanita Bobbs and Jade Mayne, who will look to continue their fine form in the green and gold when arriving in London. South Africa will take part in Group C facing off against Germany (World Ranking – 6th) on 21 July, Spain (11th) on 26 July and Argentina (3rd) on 28 July. Teams that finish first will progress straight to the quarterfinals, teams finishing 2nd or 3rd will move to the playoffs while the fourth-placed team will be eliminated. SA Hockey would like to thank Grays South Africa and Private Property for their continued support of SA Women’s Hockey. We caught up with SA Women’s hockey legend, Shelley Jones to get her thoughts on the upcoming tournament. How do you feel going in to the World Cup? What do you expect from the tournament? I have been fortunate to play in 4 World Cups and it is always a prestigious and amazing tournament to be a part of as it’s the best of the best coming together to fight it out. This year should be a great World Cup to be a part of as England certainly know how to put on events and after their women’s recent Olympic Gold medal from Rio, the interest in the sport, both participation and spectatorship, has grown dramatically. How has the team prepared for the tournament? We also recently played the annual inter provincial tournament in Durban, which allowed the selectors to make changes and include some new players. We have all been following a strict fitness, power and gym program where we are submitting test results every week to make sure every player is staying motivated and in the best condition possible. The SA Women’s World Cup team is scheduled to leave 30 June for a 3-week preparation phase in the Netherlands where we are scheduled to play some international competition in some practice matches. This will be amazing preparation to add final touches and get the team on the same page before the start of the world Cup on the 21st July. What can supporters look forward to from the team? We will really be looking to attack and creates some more goal scoring opportunities which we have identified that we can work on after the last tournament. With the addition of 2 more strikers we will be adding some speed and different attacking styles to our offense. Unfortunately, we are without some crucial players due to injury and retirement but its great to be able to include some younger future players to the mix and give them experience like I had 12 years ago in my first World Cup, to kick start their National career. This tournament is important for the future of hockey in this country, as we want to remain competing with the big hockey Nations and keep growing the sport on the world stage. Private Property has been nominated as Sponsor of the Year, for their work with the South African Women’s Hockey team. 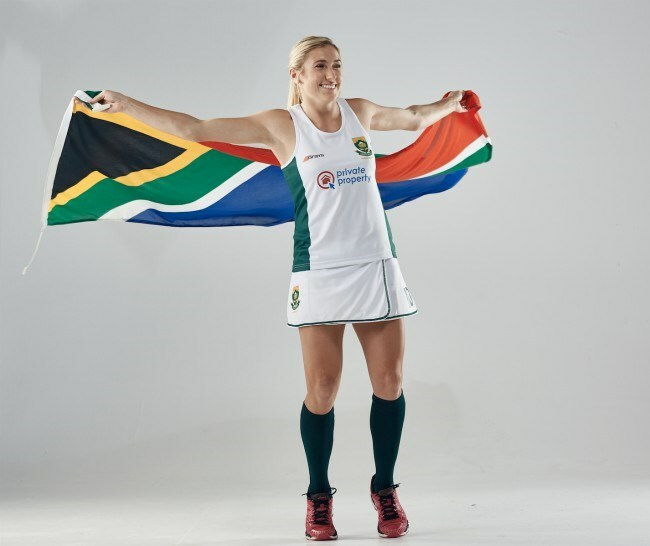 The SA Women’s Hockey team will be representing the rainbow nation at the 2018 Gold Coast Commonwealth Games in Australia between 4-­‐15 April. Private Property are proud sponsors of this international hockey tournament in which the SA ladies take on India, Germany and Scotland.